We often get to know about many saints and great people through stories or recorded material; to know how they used their wisdom and compassionate hearts in their childhood to bravely overcome circumstantial difficulties and hardships that they encountered. Now, this story takes place when Master was small, when She was about nine years old. Let us learn together from this example. Master grew up in Au Lac. She had a father who was a doctor with very good medical skills. Diseases that could not be treated by other doctors were successfully treated by him. He was also very compassionate. Very often, poor patients were not charged. After the patients recovered from their illnesses, they often expressed their gratitude to him by sending him sugarcane, sweet potatoes, vegetables and various local products which they had grown themselves. Master's mother was kind, wise, diligent and quick in her work. Apart from looking after the family, she was also successful in doing some business. Therefore, the whole family had an affluent, stable and calm life. One day, someone suddenly wrongly accused Master's father of being involved in political activities. Quickly, Her father was locked up for investigation. The investigating officers could not find any evidence linking him to the political activities, despite repeated attempts. However, he was not released, continued to be kept in prison. At that time, Master and Her mother often took some food and solace to Her father when they visited him. Seeing that Her father was physically hurt and had lost his freedom, Master was deeply grieved. She understood very well that Her father, who only practiced medicine to save people, was unjustly accused. After going home, whenever She met someone She could talk to, She would tell them that Her father was innocent and was a victim of a wrong accusation. Although they could not possibly help in any way, it did show Master's love for Her parents and courage to speak and fight for justice, even when She was still young. During this time, Her pregnant mother was due to give birth. Unfortunately at that time, they were cheated in business and lost all their money. Furthermore, after giving birth to her younger sister, her mother did not receive good care and developed postnatal complications. Fluid accumulated in her abdomen so it became quite distended. It was very painful and there was no money to seek treatment from any doctor. At only nine years old, apart from looking after Her sick mother and helping to look after the newborn baby, Master also had to go to the market to buy food. Because of a lack of money, She could only buy a few vegetables each day. Life was really very hard. On the third day, seeing that Her mother was groaning in pain, that Her sister was weak and had no one to look after her, that there was no money at home, that She was still young, and that Her father had lost his freedom, Master knew that if everything continued there would be no hope for Her family. Therefore, She decided to get Her father home. At that time, Her father was sent to a larger prison, very far away from their home. The determined Master, with Her little body which experienced travel sickness, managed to reach Her destination after changing vehicles several times. She spoke to the guard at the gate, telling him of the difficulties at home and of Her wish to see the superintendent of the prison so She could beg him to release Her father because he was innocent. The guard at the gate was very sympathetic to Master's situation. He asked Master to wait and said he would tell the superintendent. However, time kept passing. Eventually, the greatly anxious Master could not help but cry out. She cried and made a lot of noise about wanting to see the superintendent to ask him to release Her father. Finally, Her crying was heard by the passing superintendent who came over and asked what had happened. The superintendent listened carefully to the small, but very lovely little girl that stood before him. This little girl told of Her father's injustice, of the seriously ill mother with no money to seek treatment, of a younger sister born only three days ago with no one to look after her, and that she was still so young. She begged the superintendent to release Her father so he could take care of the family. The young and friendly superintendent was deeply moved after listening to Her. Looking at this dust covered girl - only nine years old yet courageous enough to take on a long trip alone, he said: "I'll ask someone to bring Your father here immediately." On seeing that Master's father was very scholarly, and after reviewing the records, the superintendent understood that there must have been some mistake. He immediately released Her father by granting him twenty-four hours freedom to go home to take care of the family, but then he had to report back to the prison. The superintendent jokingly remarked that Master should stay behind as a hostage until Her father returned. Master immediately replied: " I am useless for your here. My age is too young. Besides, I have to go back to take care of mother and my younger sister. I cannot stay." After listening to this, the superintendent laughed and agreed that Master could go home together with Her father. With very good medical expertise, Her father treated Her mother's illness immediately when he got home so that her condition improved rapidly. After dealing with all the family problems, Master's father went back to prison on time. After a few days, Master's father was suddenly released unconditionally. In order to show their gratitude and to remember the upright and compassionate superintendent, Master's parents used the superintendent's name, "Quang Trung" (*), to name Her newly born little sister. 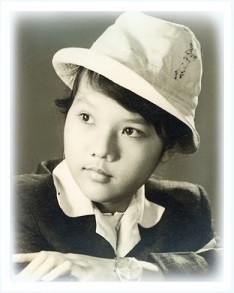 From this story, we know that although Master was young at that time, with a pure and sincere loving heart toward Her parents and courage, She was able to move human beings and heaven to make the superintendent become a good tool of God to help Her family reunite and have a bright future together. ＊ Quang Trung is a boy's name. In Au Lac especially, only a boy is given this name, never a girl. Just like in America, John is a boy's name. It was solely out of gratitude that Master's parents gave the youngest sister this name.